Technology is dangerous. One second you’re prancing around with your online pals, slaying monsters. The next, you’re locked inside the game and forced to play some crazed video game designer’s cruel game in order to even leave the game. Oh, and dying in the game means dying in real life, so you’d better get good quick. You’d better be like Asuna; get your friend, Lisbeth, to forge you a +32 sword that will slay anything that comes in your way. Oh, wait. You’re not friends with Lisbeth? Then you are really out of luck, aren’t you? Don’t worry. We’ve got you covered. 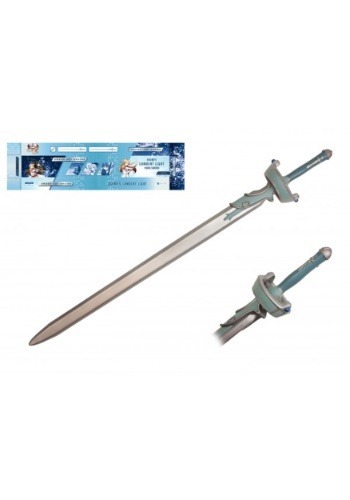 You can get this officially licensed replica of Asuna’s Lambent Light from the hit anime series, Sword Art Online. Heathcliff won’t catch you off-guard when you have this fine looking toy weapon in your hands. Crisis averted! This Sword Art Online Lambent Light Sword is a prop replica designed to look just like the sword used by Yuuki Asuna in the anime. It’s made of foam with a rigid plastic core. You can add it to your Asuna cosplay costume, or just use it to finish your Sword Art Online collection. You can even let Kirito borrow it if he needs to put the finishing blow on Heathcliff.